The more whole grains you eat, the lower your risk of Type 2 diabetes, cancer, heart disease and digestive problems, reports the Harvard School of Public Health. A whole grain includes all three parts of the wheat kernel: the endosperm, the bran -- the kernel's outer layer -- and the germ, the embryo of the grain. You can get both wheat germ and wheat bran separately. Add them either to cooked or cold cereal, as a replacement for some of the flour in baked goods or mix them into ground meat dishes for extra nutrition. A 1-ounce serving of toasted plain wheat germ contains 108 calories, with 27 calories supplied by 3 grams of total fat, including 0.5 grams of saturated fat. The same serving size of toasted wheat bran contains 57 calories, with 1.5 grams of fat and 0.2 grams of saturated fat for a total of 13 fat calories. Both are a good source of poly- and monounsaturated fats, and neither contain cholesterol or trans fats. Wheat germ has 14 grams of carbohydrates in each 1-ounce serving, while wheat bran contains nearly 17 grams per ounce. Both are also dense with soluble and insoluble fiber, though wheat bran has a higher concentration of both. A single 1-ounce serving of wheat bran contains 11.8 grams of fiber, or approximately 42 percent of a woman's recommended daily fiber intake and 32 percent of a man's. Wheat germ has a small amount of simple sugars; wheat bran has none. Wheat germ and wheat bran are rich in protein: wheat bran contains 5 grams per ounce and wheat germ supplies 8 grams per ounce. Eating a serving of wheat germ fulfills 17 percent of a healthy woman's daily protein needs, while the bran fulfills about 11 percent of her protein RDA. Wheat germ gives a man 14 percent of his daily requirement per ounce and wheat bran would supply 9 percent per ounce. Wheat bran and wheat germ contain high levels of the B vitamins, including riboflavin, pantothenic acid, vitamin B-6, folate and thiamin. Wheat bran is richest in niacin: Its 5.8 milligrams per ounce fulfill 41 percent of a woman's RDA and 36 percent of a man's. Wheat germ has more thiamin. Each 1-ounce serving contains about 0.5 milligrams, supplying at least 41 percent of an adult's daily requirement. Both wheat germ and wheat bran are excellent sources of manganese, with each containing far more of the mineral per ounce than the adequate intake for men and women. 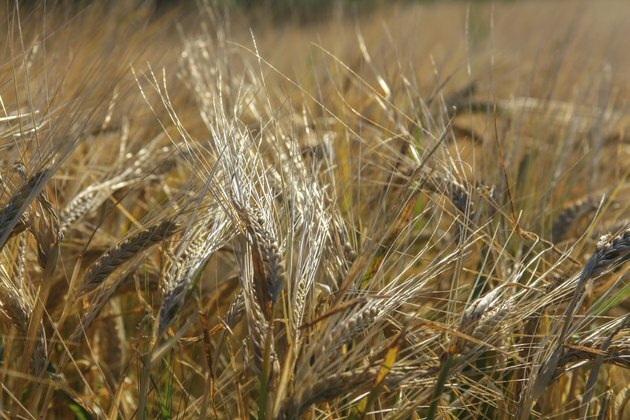 Wheat germ and wheat bran are also high in iron, copper, zinc and magnesium. In addition, wheat germ contains 33 percent of the RDA of selenium for adults. Whole Grains Council: What is a Whole Grain?